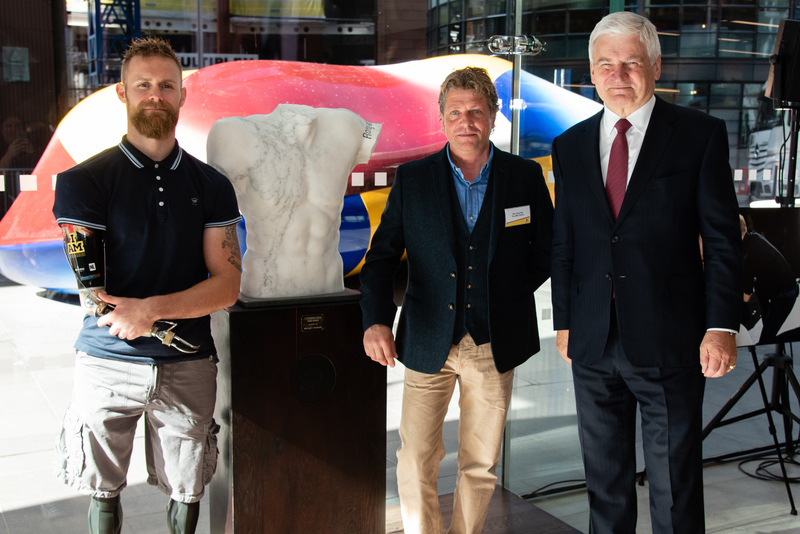 A classical sculpture of the UK’s first triple amputee from the Afghanistan War and Invictus Games champion Mark Ormrod is currently touring corporate buildings in London to culminating in an auction to raise thousands of pounds for Military Charities, The Royal Marines Charity and Blesma, the Limbless Veterans. “Undefeated” has been created by international sculptor Ben Dearnley, who approached Mark in 2016 about the project, to help raise funds for the two main charities who have helped Mark and many other returning wounded ex-Service men and women through their recovery process. The sculpture, which is a torso of Mark’s body, is made from Carrara marble with inset lead lettering, will tour several corporate lobbies including Barclays, Aviva and HSBC, before it is finally auctioned at The Royal Marines Charity Commando Dinner, which is to be held at Guildhall, London on 20th November 2018, to raise further funds for both charities. “I’m not arty, but when Ben explained more about the project and how we would auction it off at the end, I thought it was the perfect project,” said Mark, who was badly wounded whilst serving in Afghanistan in 2007. In the early hours of Christmas Eve 2007, Royal Marines Commando Mark was out on a routine foot patrol in the Helmand Province when he stepped on and triggered an improvised explosive device. Mark lost both his legs above the knee and his right arm above the elbow. He was the UK’s first triple amputee to survive the Afghanistan conflict. Mark was told by doctors that he’d never walk again and that he should prepare himself for the rest of his life in a wheelchair. However, Mark learnt to walk again with the aid of specialist prosthetic limbs, and just last year, he competed at the 2017 Invictus Games in Toronto, and was the winner of four medals. Own a piece of history: if you would like to make a bid for the astounding sculpture, please visit: https://theroyalmarinescharity.org.uk/undefeated . All proceeds will go towards further help for wounded service men and women.